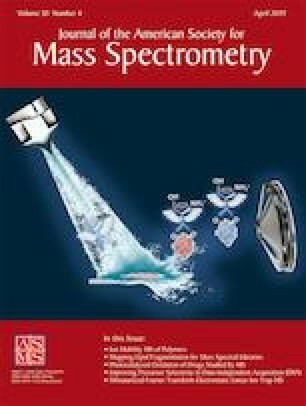 We study the space charge limited maximal current density j″ of mobility-selected ions that can be transmitted in ion mobility spectrometry (IMS). Theory and experiments focus on differential mobility analyzers (DMAs), but are readily generalizable to other IMS devices. Repulsion between the ions in the cloud leads to beam spreading, with significant broadening once the ion number density n becomes comparable to the space charge saturation limit nsat = εoEo/(eΔ). Δ is the distance traversed by the ions in the direction of an externally imposed electric field Eo, and e is the charge on each ion. For ions of electrical mobility Z, j″ is then limited below j″sat = ZEoensat = ZεoEo2/Δ. A theory including diffusion and space charge effects is developed that reduces to Burgers’ exactly solvable equation. The theory is tested in experiments with room temperature electrosprays (ES) of 100 mM [ethyl3N+-formate−] in methanol. This spray produces primarily a single ionic species at very high initial concentration n, which may be tuned above or below nsat by varying the distance from the ES emitter to the inlet slit of the DMA. 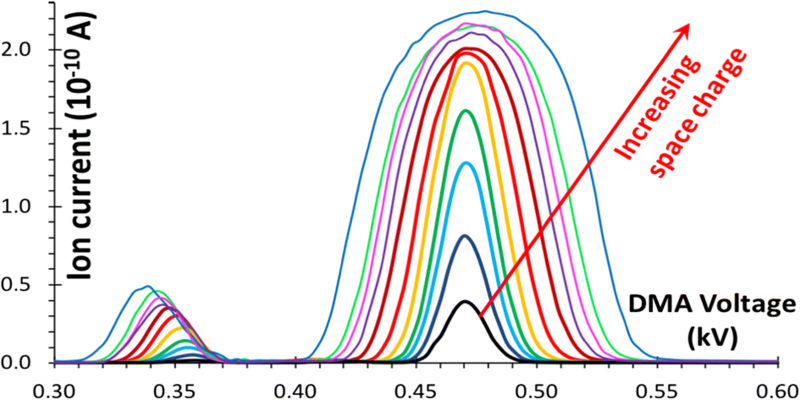 Mobility-selected ion densities n > 3.108 ions/cm3 are achieved, with n~nsat, and with drastically broadened mobility peak shapes having the approximate top hat-predicted shapes. However, the largest n values approaching nsat are not quantitatively measurable because the densest sprays do not fill the outlet slit length. It is an honor to be part of this special issue recognizing my long admired colleagues Clemmer and Jarrold. I am grateful to Dr. Anatoly Verenchikov, Gonzalo Fernandez de la Mora, and Mario Amo-Gonzalez for their stimulus to embark in this study. Following Yale rules the author declares a conflict of interest with the company SEADM, commercializing variants of the parallel plate DMA and the electrometer used in this study.